The Colts intend to allow free agent cornerback Rashaan Melvin hit the open market, general manager Chris Ballard told reporters, including Stephen Holder of the Indianapolis Star (Twitter link). That’s perhaps unsurprising given that Melvin is one of the more intriguing and unproven players scheduled to hit free agency next month. Melvin, 28, had appeared in only 12 games and made two starts before joining the Colts in 2016. He’s since started 19 games over the past two seasons, and was outstanding in 2017, grading as the NFL’s No. 17 cornerback, per Pro Football Focus. While Melvin could certainly become a diamond in the rough for a team who trusts him as a full-time starter, it’s also possible he turns back into a pumpkin, so there’s risk involved in his free agent case. 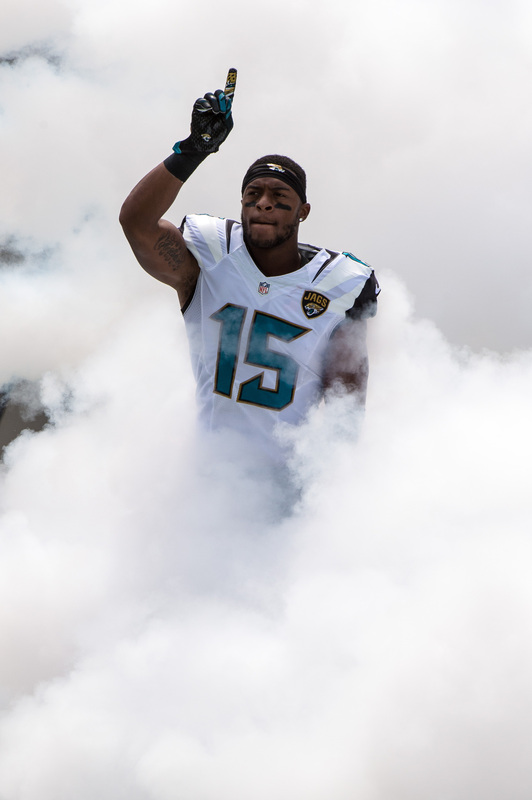 While the Jaguars hope to retain free agent wideout Allen Robinson, they’re “far more likely” to to sign several cheaper options than pay up for Robinson, according to Jason La Canfora of CBSSports.com, who points to fellow Jacksonville free agent Marqise Lee as an alternative for general manager Dave Caldwell & Co. The Jaguars are reportedly open to using the franchise tag on Robinson, which would enable them to keep their top pass-catcher for a one-year cost of ~$16MM. However, Jacksonville is relatively cap-strapped, so adding multiple low-cost options could make more financial sense for the team. The Colts have continued to fill out Frank Reich‘s staff by hiring Tom Rathman as running backs coach and Kevin Patullo as wide receivers coach, reports Alex Marvez of the Sporting News (multiple stories). Rathman previously served two stints with the 49ers, but he won’t coaching his former pupil Frank Gore, whom Indianapolis does not plan to re-sign. In addition to his work in San Francisco, Rathmaan has also coached in Detroit and Oakland. Patullo, meanwhile, has led quarterbacks and wide receivers in stops with the Jets, Titans, and Bills, but spent 2017 as an analyst for Texas A&M. 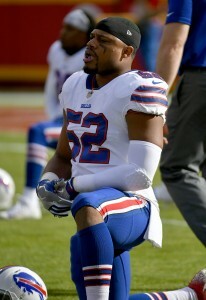 The Patriots are “believed” to be among the clubs interested in Bills free agent linebacker Preston Brown, according to Jeff Howe of the Boston Herald. Brown, in turn, seems to be open to an offer from New England. As Brown alludes to elsewhere in Howe’s piece, the Patriots have made a habit of poaching Bills players over the past few seasons. In 2016, New England inked restricted free agent wideout Chris Hogan to an offer sheet that Buffalo failed to match, and last year, the Pats signed unrestricted free agent cornerback Stephon Gilmore and RFA running back Mike Gillislee. The Patriots could certainly use help at the second level of their defense, as the unit ranked 31st in run defense DVOA and allowed the second-most adjusted line yards in the league a season ago. New England also struggled covering opposing running backs in the passing game (22nd in DVOA, per Football Outsiders), and none of the club’s primary ‘backers ranked among the top-50 in Pro Football Focus‘ positional grades. Stalwart Dont’a Hightower will return from injury in 2018, but the Patriots could still stand to add another linebacker. Brown, 25, led the NFL in tackles last year while playing the third-most defensive snaps (1,180) of any linebacker in the league. The former third-round pick has started nearly every possible game (62 of 64) during his four-year career, and has never missed a contest due to injury. Per Howe, the Patriots would likely be interested in Brown at a $5MM annual price point. If his cost jumps into the $8MM per year range, New England would be expected to bow out. In advance of March 14, the start of free agency in the NFL, Pro Football Rumors will detail each team’s three most glaring roster issues. We’ll continue this year’s series with the Jacksonville Jaguars, who finished with a 10-6 record before advancing to the AFC Championship Game for the first time in more than 20 years. 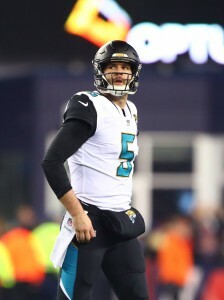 Must exercise or decline 2019 fifth-year option for DE Dante Fowler Jr.
1) Add competition for Blake Bortles: The Jaguars will run it back in 2018 — instead of exploring a quarterback upgrade via the free agent market, where they could have gone after Kirk Cousins or Case Keenum, the Jags will stick with Blake Bortles after agreeing to a new three-year, $54MM deal that contains $26.5MM in guarantees. Bortles was already under contract for more than $19MM in 2018 thanks to Jacksonville exercising his fifth-year option. That option is guaranteed for injury only, but given that Bortles is recovering from wrist surgery and likely wouldn’t have been able to pass a physical, the $19MM+ figure could be considered effectively fully guaranteed. Under the terms of Bortles’ new contract, his cap charge will be reduced to just $10MM, giving the Jaguars about $9MM in additional cap space. The pact will add a partially guaranteed base salary in 2019 ($6.5MM of $16MM is fully guaranteed), which will make it difficult for Jacksonville to part ways with Bortles: a $16.5MM dead money charge would accelerate onto the club’s salary cap if it releases Bortles next offseason. That number might not be as scary given that Bortles’ contract now contains offset language (meaning the Jaguars will be off the hook for whatever salary Bortles theoretically earns with a new team), but there’s no doubt Jacksonville has committed to keeping some form of Bortles — either the flesh-and-blood player, or simply the remnants of his salary — on its 2019 books. But the move to extend Bortles wasn’t about the 2019 campaign — no, it was about the upcoming season, when the Jaguars clearly feel they can once again compete for the AFC championship and a Super Bowl title. Once it became clear Bortles and his $19MM salary would stick due to injury, Jacksonville didn’t have a ton of other options. So decision makers Tom Coughlin and Dave Caldwell opted to double down on 2018, create cap space to solidify other parts of the Jaguars roster, keep Bortles in place as the team’s starting quarterback, and worry about 2019 when the time comes. However, Bortles’ new contract shouldn’t preclude the Jaguars from adding long-term competition under center, and while that will likely need to occur in the draft, there is one free agent signal-caller who could make sense for Jacksonville. 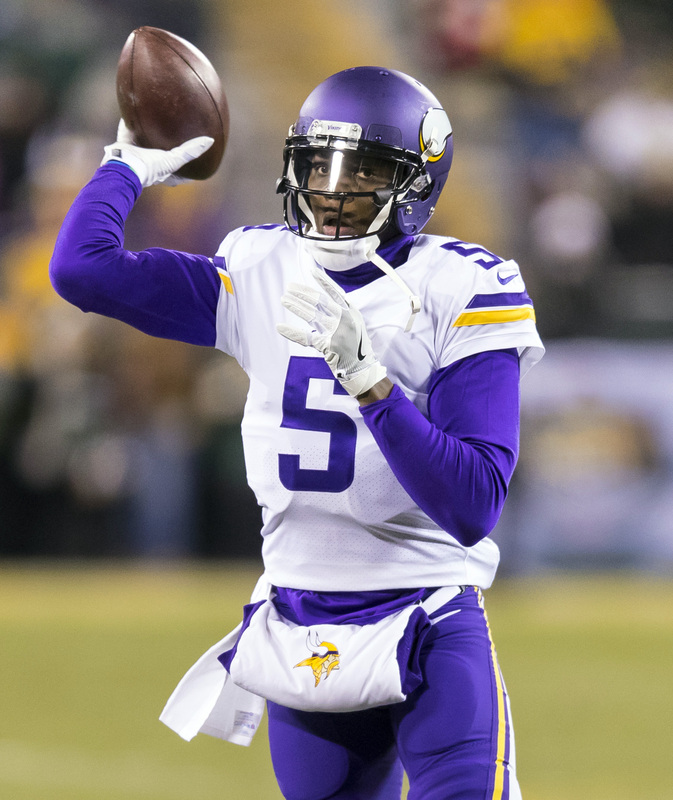 Teddy Bridgewater will officially hit the free agent market after five seasons with the Vikings, and while all the tea leaves point to him returning to Minnesota, the former first-round pick could be interested in moving on, especially if the Vikes bring in Kirk Cousins. Bridgewater, of course, hasn’t played a full season since 2015 while recovering from a gruesome knee injury, but he’s still only 25 years old. Perhaps he’ll want to land with a team that will allow a clearer shot at a starting job, but I question whether NFL clubs will trust Bridgewater’s health. Jacksonville, though, could promise Bridgewater the chance to start later in the 2018 season if Bortles fails, and might be able to ink him to a contract that would keep him in town through 2019 or 2020. In the draft, the Jaguars aren’t likely to get a shot at Sam Darnold, Josh Rosen, Baker Mayfield, or Josh Allen, but Louisville’s Lamar Jackson could be available at pick No. 29. Jackson, the 2016 Heisman winner, would be fascinating entrant as Bortles’ backup in 2018 and a future starter in 2019 and beyond. Lance Zierlein of NFL.com calls Jackson a “maestro of improv who is Second City worthy,” and Jackson would be deadly utilizing run-pass options in Jacksonville’s offense. He needs work — Zierlein says Jackson needs to improve his accuracy on the run and his pocket awareness — but the former Cardinal seems like a high-risk, high-reward option that would mesh with the rest of the Jaguars’ roster. 2) Bolster the offensive line: Jacksonville invested in its offensive line in 2017, using the 34th overall selection on Alabama tackle Cam Robinson. Although he started 15 games on the blindside during his rookie campaign, Robinson graded as a bottom-five tackle in the NFL, according to Pro Football Focus, seemingly confirming pre-draft concerns that he was a right tackle or guard. 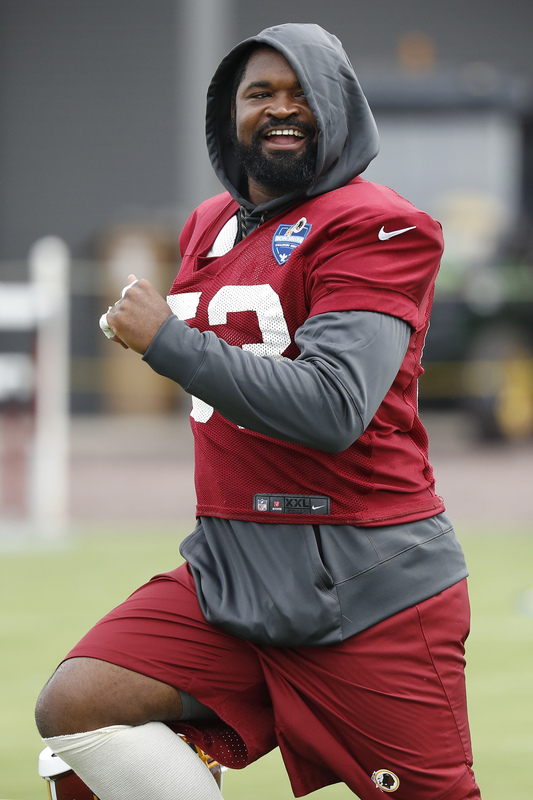 Ideally, the Jaguars would add new left tackle, shift Robinson to the right side, and release incumbent right tackle Jermey Parnell, but the utter lack of left tackles in both free agency and the draft makes that strategy untenable. 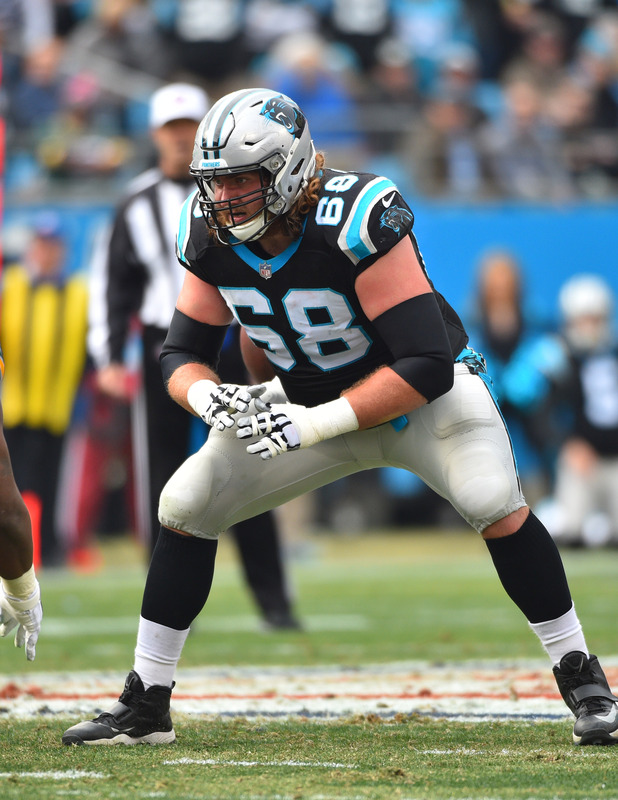 Jacksonville has never been afraid to spend in free agency, and it wouldn’t be out of the question for the club to go after Panthers guard Andrew Norwell, who figures to be one of the top free agents available on March 14. While the Jaguars use signing bonuses sparingly (they prefer to front load deals and, in turn, make them easier to get out of after a year or two), Caldwell & Co. could give Norwell fully guaranteed base salaries in both 2018 and 2019 while utilizing a small bonus that won’t incur much dead money down the line. Norwell will almost surely aim to top recent guard contracts given to Kelechi Osemele and Kevin Zeitler by earning $13MM annually, and the Jaguars could fulfill that requirement by offering a creative contract. If Norwell proves unattainable, Jacksonville will other free agents to consider at guard. Josh Sitton will now hit the open market after the Bears declined his 2018 option, and he’d make sense for a win-now Jaguars team. Jack Mewhort, Josh Kline, Zach Fulton, and Spencer Long are all age-29 younger and have started at least 30 career games. If Jacksonville is comfortable adding an older player, Matt Slauson, Brandon Fusco, or Alex Boone could come into play. The Jaguars could even explore trades: current Jacksonville offensive line coach Pat Flaherty worked with Ereck Flowers during his rookie season in New York (as did Coughlin), so if the Giants make the former first-rounder available for trade, could the Jags acquire him and move him to guard? The draft offers another avenue through which the Jaguars can add help at guard, and if the club doesn’t use its first-round pick on a quarterback, I’d fully expect it to select an interior lineman at pick No. 29. A plethora of guard options means Jacksonville should see a solid player slip to the end of the first round, and Billy Price (Ohio State), Isaiah Wynn (Georgia), James Daniels (Iowa), and Will Hernandez (UTEP) will all be in consideration for the Jaguars. Hernandez, specifically, impressed during Senior Bowl practices, per Michael DiRocco of ESPN.com, who identifies the UTEP product as someone Jacksonville will watch at the scouting combine. 3) Make decisions at wide receiver: Heading into the 2016 season, the Jaguars appeared to boast one of the league’s more impressive wide receiver corps. Allen Robinson was fresh off a 1,400-yard campaign in which he led NFL in receiving touchdowns, while Allen Hurns also topped 1,000 yards as Jacksonville’s No. 2 pass-catcher, and subsequently inked a four-year, $40MM extension. Things have changed, but the Jags aren’t necessarily worse off. Robinson — a pending free agent — is now recovering from a torn ACL but expects to be ready for 2018, and Hurns is likely to be released, but Jacksonville has also discovered an entirely new crop of wideout talent on its roster. Former second-round pick Marqise Lee finally grew into himself to post back-to-back solid campaigns, while young players such as Keelan Cole and Dede Westbrook have proven themselves as contributors. Now, the Jaguars just need to sort out which receivers will be on their roster going forward. Robinson is clearly the key piece as Jacksonville analyzes its receiver room. The Jaguars are open to deploying the franchise tag on Robinson, and while such a tender would be worth more than $16MM, it would offer the club several benefits. First and foremost, it would keep Robinson on the roster as Jacksonville competes for a Super Bowl in 2018. And while the tag is expensive, it would allow the Jaguars to see how Robinson plays in his first foray after his ACL tear. If he progresses well, Robinson could be extended in-season à la Alshon Jeffery. Hurns, meanwhile, is likely a goner no matter the outcome of the Robinson talks — he hasn’t topped 500 yards in either of the past two years, and the Jaguars can clear his entire $7MM cap charge through release. Lee, meanwhile, is a pending free agent, and if Jacksonville brings Robinson back, I’d expect Lee to sign elsewhere. While he’s a decent No. 2 wide receiver, Lee at $5-6MM annually doesn’t make sense for the Jaguars if they’re already paying Robinson $16MM+ and have affordable alternatives such as Cole and Westbrook. The Raiders have made an extension offer to star edge rusher Khalil Mack, according to Vic Tafur of the Atheltic (Twitter link). Mack and his representatives are currently mulling the terms of the deal, per Tafur. Mack, who turned 27 years old last week, is one of the NFL’s premier pass rushers, and has solidified that status by posting 36.5 sacks over the past three seasons. In 2017, Mack put up 10.5 sacks, finished second in the league with 53 pressures, and graded as the NFL’s No. 5 edge defender, per Pro Football Focus. The fifth overall selection in the 2015 draft, Mack has never missed a game during his four-year pro career. The Raiders have Mack under contract for one more year, and he’ll earn a fully guaranteed base salary of $13.846MM in 2018. 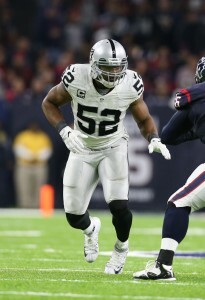 While Oakland could conceivably use the franchise tag on Mack in 2019, the club surely prefers to hammer out a long-term deal. General manager Reggie McKenzie recently indicated that a 2018 extension was likely to be arranged. Mack will likely seek to top fellow AFC West pass rusher Von Miller‘s $19.083MM annual value, and should be fully expected to shoot for a $20MM per year salary on his next contract. For what it’s worth, the Raiders generally prefer to avoid signing bonuses (and in turn, work out contracts that are relatively easy to escape), but Oakland did give quarterback Derek Carr a $12.5MM signing bonus on his recent extension. Whether the Raiders will stick to their typical contract structure, or be amenable to changes given Mack’s talent and importance, is unclear. The Saints do not plan to re-sign free agent defensive back Kenny Vaccaro, sources tell Josh Katzenstein of NOLA.com. Vaccaro is wrapping up his rookie contract (which included an exercised fifth-year option) with the Saints, and he’ll be an interesting free agent given that he has the ability to play both safety and slot cornerback. The 27-year-old graded as one of the NFL’s best run-defending defensive backs in 2017, but ranked as the single-worst coverage safety in the league, according to Pro Football Focus. Despite that lack of production, it’s still possible Vaccaro meets a solid market given his first-round pedigree and positional versatility. The Cowboys, speculatively, could have interest given that they reportedly attempted to trade for Vaccaro last season. 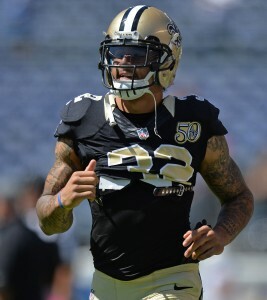 On the open market, Vaccaro will join a list of safeties that includes Lamarcus Joyner, Eric Reid, and Morgan Burnett, while available slot corners include Nickell Robey-Coleman, Aaron Colvin, and Patrick Robinson. The Saints, for their part, have drafted two safeties — Vonn Bell and Marcus Williams — in the past two years, so their need to retain Vaccaro is lessened. New Orleans is also hoping to get a number of cornerbacks healthy in 2018, so Vacarro wouldn’t have been required in the slot. 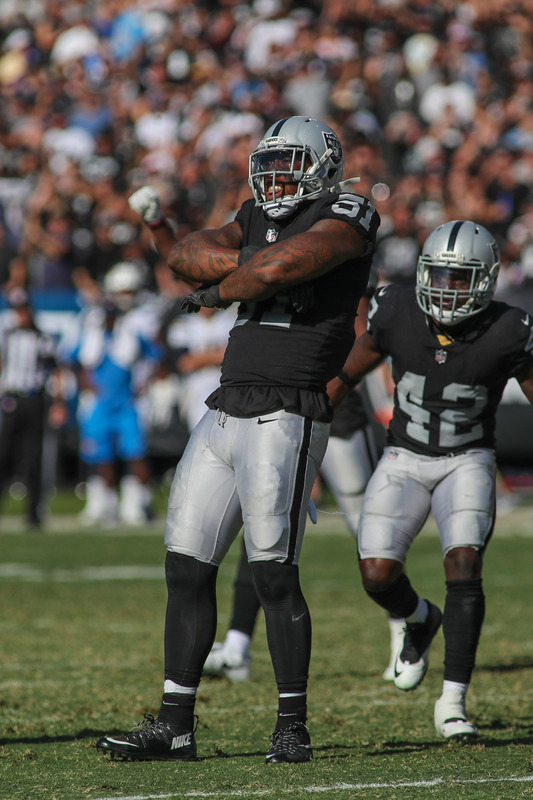 The Raiders will not release linebacker Bruce Irvin, general manager Reggie McKenzie told reporters, including Michael Gehlken of the Las Vegas Review Journal. Irvin will enter the third season of a four-year, $37MM pact he signed with Oakland prior to the 2016 campaign. Next season, the 30-year-old defender will earn an $8MM base salary and a $250K workout bonus. The Raiders could have cleared that entire total by cutting ties with Irvin this offseason, but they’ll instead retain him for at least one more go-round. Last year, Irvin totaled 58 tackles and matched his career high with eight sacks. For his efforts, he graded out as the No. 48 ranked edge defender in the league, per Pro Football Focus. His 77.0 overall score was roughly in line with his career average, but a slight downtick from his career-high 81.8 showing in 2016.